Born in Vienna, Austria, Emma Fordyce MacRae became a noted painter of floral still lif, landscapes, waterscapes and female figures. She was raised in New York City in a wealthy family that traveled frequently to Europe. Most of her professional life was in New York City, but she also spent much time in Cape Ann and Gloucester, Massachusetts. MacRae studied at private schools while growing up. She married Thomas MacRae, a physician who practiced with her father, a dermatologist. However, she and Thomas stayed together less than a year, and the marriage was annulled ten years later. In 1922, she married Homer Swift. In 1911, she enrolled at the Art Students League, studying with Frank Vincent DuMond and Kenneth Hayes Miller. In 1915 and later, she studied with Francis Luis Mora, John Sloan and Ernest Blumenschein. At the New York School of Art, she again studied with Miller and with Robert Reid. In 1914, she had her first exhibition, which was in New York at the Anderson Galleries. The style of those exhibited paintings was "broad impressionist inspired" with "a hint of the form and the careful arrangement that would characterize her later compositions." Throughout her career, Central Park was a frequent subject of her landscapes. Other favored locations were around Cape Ann and Gloucester, especially the beaches and coves of Ipswich Bay. Unlike many of her contemporaries in those locations, she avoided painting the open vistas of the ocean. 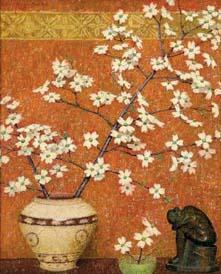 Her still life paintings were unique for that time in that she often used "props" that she owned such as simple ceramic pots or Oriental vases and combined them with figurines. Her treatment of the background and foreground frequently gave the impression of being merged. Most of her figure paintings were interior scenes with simplified female forms. In 1925, she inherited a home that her father had built in Gloucester, which meant she spent considerable time in that location as well as New York City. She exhibited at the Gallery-on-the-Moors, the North Shore Arts Association and the Gloucester Society of Artists. In 1936, she and the French artist, Raoul Dufy, held a joint exhibition in New York. She became a member of the National Association of Women Artists in 1923 and was active in numerous other East Coast art associations including Philadelphia, Gloucester, and Boston. From 1918 to 1918, her work was exhibited at the National Academy.